In these days, white hair in early age is the biggest problem among with boys and girls both. This problem occurs due to pollution, poor diet and stress. Do you know the chemical based hair colors available in market are not only the solution for white hair? Today I am showing you the best natural remedy and it will take only 5 minutes, and your problem will be solved. 1. Peel the potatoes and store it in the pan. 2. Add 2 cups of water in the pan. 3. Heat the pan on high flame, when boil start in the water then reduce the flame. 4. Let it boil for 15 - 20 minutes then turn off the flame. 5. Leave it to cool down, and then strain the water. 6. First shampoo your hair and then apply conditioner. 7. 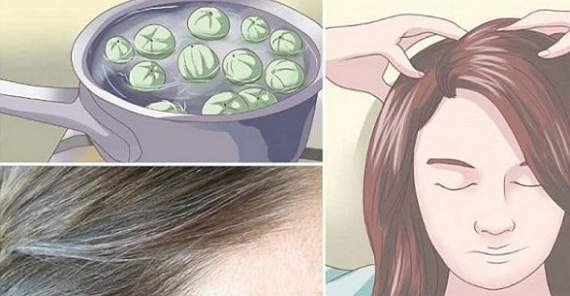 Massage your hair from this potato solution for few minutes. 8. Don’t wash your hair again, wait it to air dry. 9. At last brush your hair.